“Iceberg, straight ahead!” A fellow shipmate interrupts my quiet moment on deck as he cried out, finger pointed dramatically. At any other time aboard a ship, this would not be a welcoming statement, but off the coast of Greenland, it was a frequent outburst, and always followed by a chuckle. I bring up my binoculars to focus on the massive chunk of ice - another one of countless behemoths that have already drifted past us this afternoon - and I know that the captain will safely navigate us around this one. 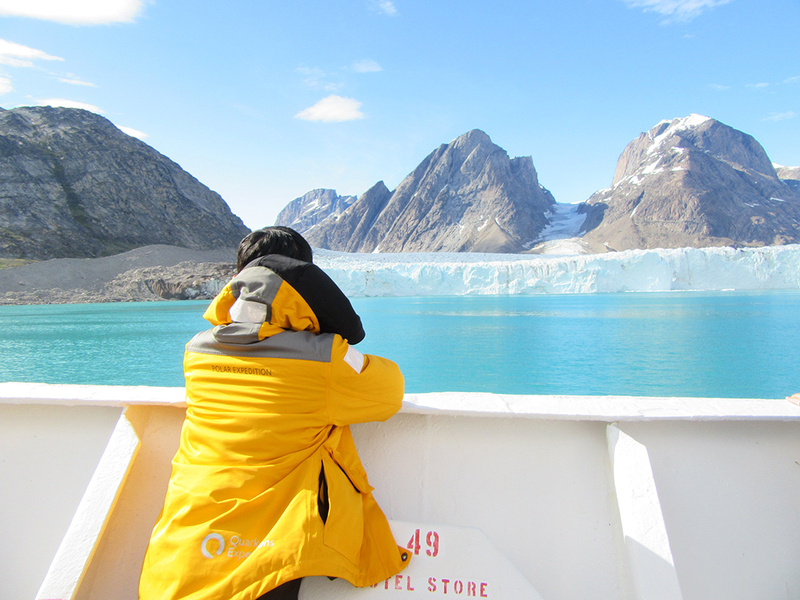 I am sailing onboard Quark Expeditions’ Ocean Adventurer, on an Arctic expedition to explore the valleys and fjords of Greenland. It’s August, the sun is shining, and I am sporting raccoon eyes - a result of the unexpected sunshine, and my negligence in applying sunscreen. My adventure had begun in Reykjavik, Iceland, where my time was spent at the Blue Lagoon. My flight had arrived early in the morning, and the lagoon - at 100° - was truly a warm Icelandic welcome to soak away my jet lag. The next day, I board the Ocean Adventurer in Akureyri, after a 45-minute flight. First stop after discovering my stateroom and trying on my warm yellow Quark parka (mine to keep! ), is to explore my home for the next eleven nights. The ship is the smallest I have been on - having just one restaurant, one lounge, a library, a small shop, and an even smaller gym. The back deck has two large hot tubs, where I would later spend many afternoons and evenings relaxing with a drink while soaking up the passing scenery. My fellow guests – 109 of them – hail mainly from the U.K., Canada, the U.S. and Europe, and the rest from Taiwan, Israel, South Africa, Australia, and New Zealand. Our expedition team is comprised of experts in all things Greenland, and we benefit from their knowledge through their lectures held throughout the voyage. From Vikings –we actually learn that the proper term is Norsemen - and glaciers to birds and geology, these informative talks help us understand the places we’re visiting, and the precious environment we must protect. We also get our first lesson in whale watching. When someone says “humpbacks at 3 o’clock”, it doesn’t mean that there will be humpback whales appearing at three this afternoon. In ship’s lingo, straight ahead of the bow is 12 o’clock, aft is 6 o’clock, and the remaining directions are identified as on the face of a clock. So, humpbacks at 3 o’clock means they are directly to the right, or starboard side of the ship. And boy do we see whales at all hours - literally and figuratively. Sightings are announced over the PA, interrupting lectures, snoozes, and dinners. I have never seen a room empty so quickly every time the PA crackles alive. We are treated to pilot whales, orca, minke, fin, and even an out of place sperm whale, traditionally not found in these shallow waters. The stars of the show though, are humpbacks, appearing almost every day. One evening after dinner, we come upon a large pod, and stop to observe them for over an hour. There are so many, it is tough to decide where to look while all hours of the clock face are called out in every direction. After every fluke-revealing dive, cheers and applause ring across the deck. A few, in particular, are quite playful, breaching and slapping their fins on the water, which results in their audience screaming in delight. Shutters click, cell phones blink, and zoom lenses…well, zoom. Who knew that Hollywood North extends as far as the Arctic, where humpbacks are the celebrities, and we are the paparazzi. After one and a half days of crossing the Denmark Strait, the horizon ahead finally reveals the snow-capped peaks of east Greenland. Everyone comes out on deck, buzzing with excitement. As if on cue, the clouds lift, and the sun comes out to welcome our group of yellow-jacketed seafaring explorers. We sail pass icebergs as tall as the ship, some smooth like Henry Moore sculptures, some multi-faceted like gleaming Swarovski crystals. Others in the horizon appear like towering white condos, an ironic mirage in this remote hinterland. As the mountains get larger as we approach, we begin to truly appreciate the vastness and the expanse of the world’s largest island. In the following nine days, our ship explores the east, south and west coasts of Greenland, circumnavigating impossibly tall fjords, sailing by countless glaciers, and making landings in remote coves. On days when it is calm and windless, I kayak with a group of nine paddlers who joined the guided program. Fashionably dressed in our onesie dry suit, booties and spray skirt, we swish our way along rugged coastlines and weave amongst small icebergs. 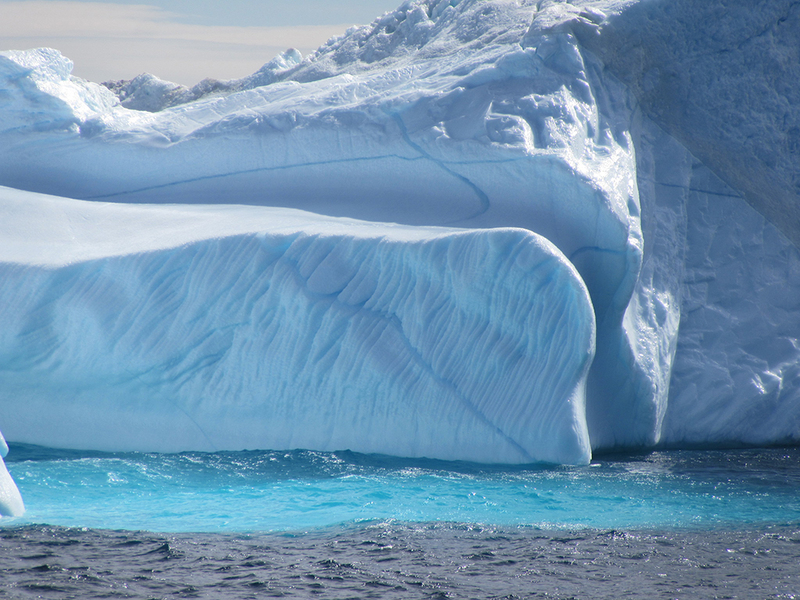 The rule is, if the iceberg is smaller than us, we can hug and kiss it all we want, but if it is not, we were to remain at a safe distance, as they can roll over any time and take us with it. My favourite moment is paddling through the broken up ice bits called brash. 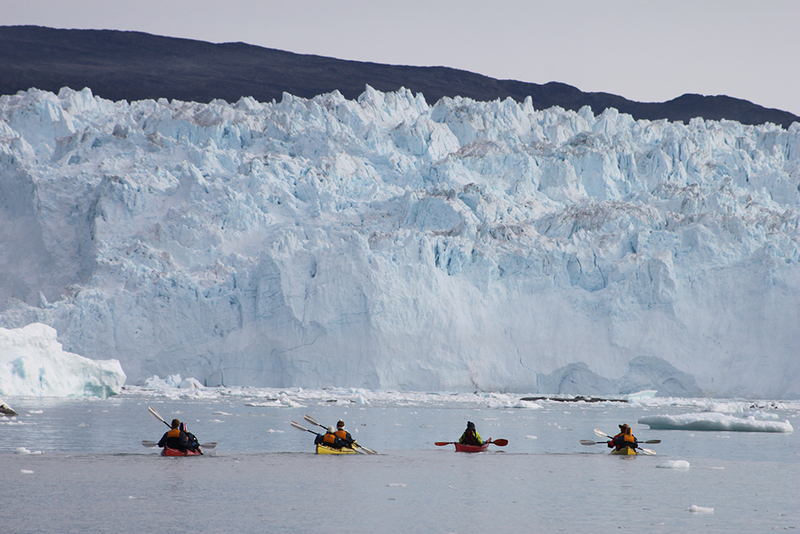 “Your kayaks are ice-proofed,” yells our guide Val, “so go have fun!” And off we go, purposely crashing through brash, pretending we are icebreakers on a mission. As my kayak slices through the water, the silence is broken by loud thuds as if I’m plowing through concrete blocks. A few of us cannot resist picking up the brash for a taste test, the slightly salty coating melts away to a crunch that’s as pure as it gets. After a thumbs up from me, my fellow paddler scoops up a large chunk to bring back to the ship’s bar. My gin and tonic that night tastes extra special knowing it was made with Arctic ice. While we are making our fun in the water, the landlubbers go on guided hikes with the expedition team. The young and fit - dubbed the Chargers - climb mountains, while the medium-fast and medium-slow groups take on tamer trails. Those who are not so inclined, wander the shoreline and contemplate the peaceful surroundings with the expedition guides. 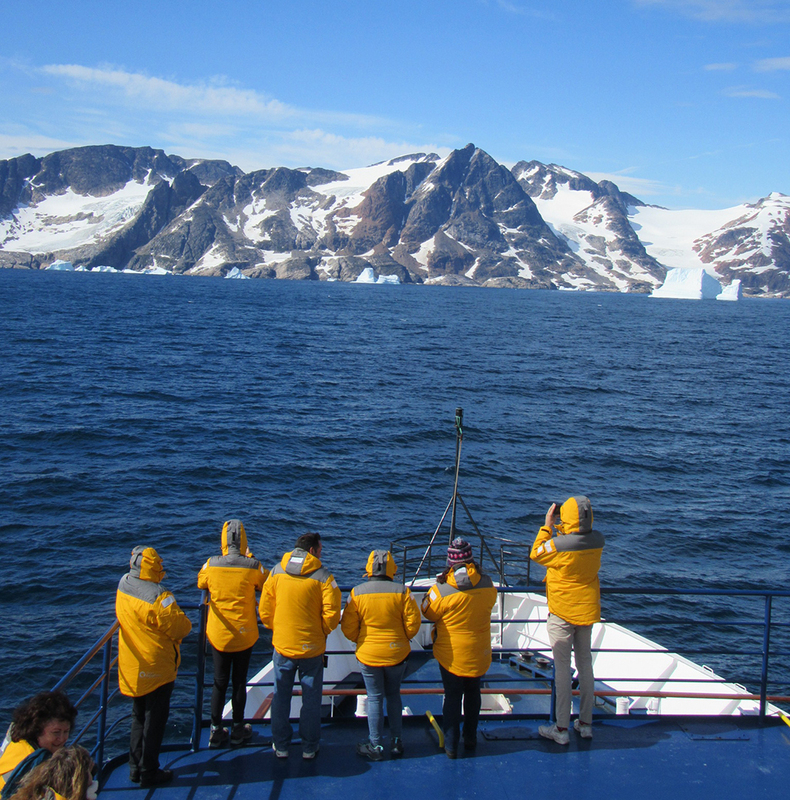 Yet others opt for zodiac cruising to get up close to nesting bird colonies and icebergs. We eventually make landfall in civilization on the west coast, stopping in Greenland’s capital Nuuk, the ice fields at Ilulissat, and Itilleq. At the latter, we are invited into local residents’ homes for coffee and biscuits, and challenge the home team to a rousing game of soccer. Needless to say, the residents prevail, and we leave as humbled visitors, thankful for the opportunity to interact. 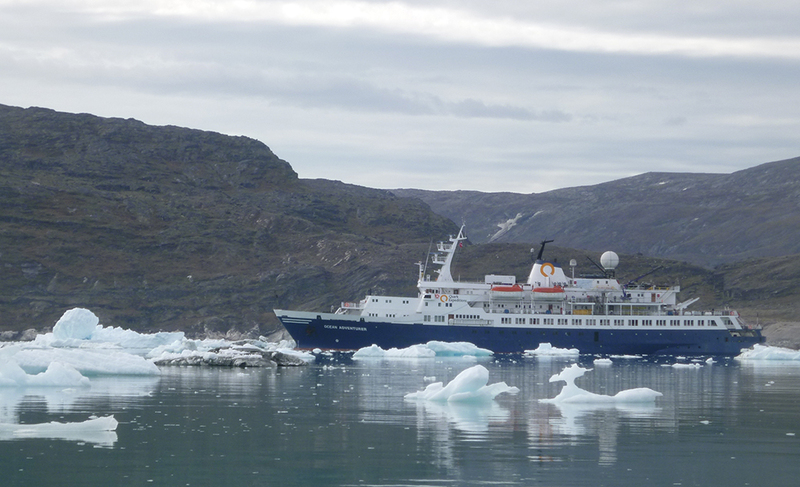 Our final night is spent cruising the 87-mile fjord towards Kangerlussuaq. It’s quiet and windless, and this far up north, there is still a smidgen of light at 11:30. Those of us who are still up on deck get a big surprise when faint traces of the aurora borealis appear overhead. The PA crackles up one last time, and soon everyone is on deck, some in their pyjamas. As the green and pink streaks snake across the sky, I look around me. Amongst the cheers, camera clicks, and cell phones, I can definitely confirm again, that our version of the paparazzi is alive and well in the Arctic. Blue Lagoon: Advanced booking is a must if you are going in the summer. Pricing varies depending on the time of day, but you may stay as long as you like. Bus transfers between the airport, Blue Lagoon, and Reykjavik city centre are available and should be booked in advance as well. 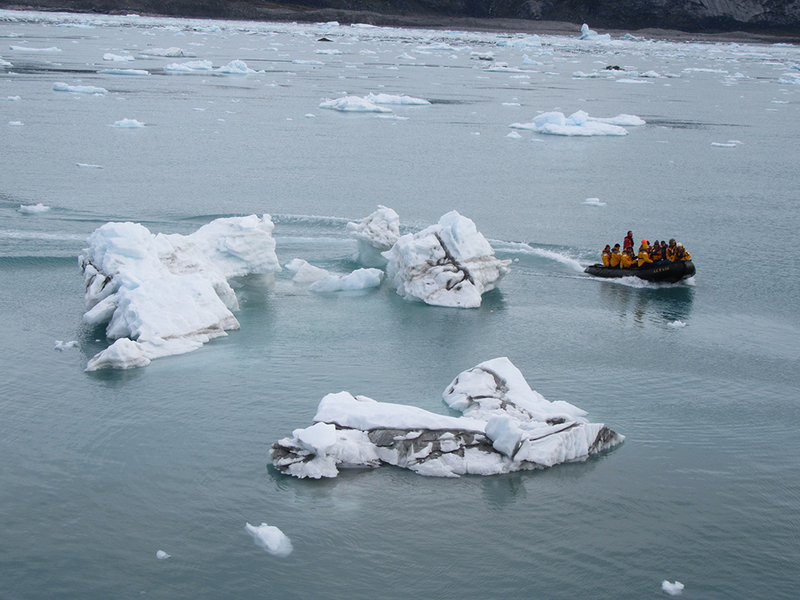 Quark Expeditions: Specializing in polar region cruising, Quark Expeditions offers sailings to Greenland, the High Arctic, North Pole, Spitsbergen, and Antarctica. Solo travellers have the option to share a stateroom for significant savings. Your professional travel agent can assist you with your planning. Article and photos by Ming Tappin for Cruise & Travel Lifestyles, 2018.